Phenibut: An Effective Memory Loss or Brain Power Ingredient? Phenibut is known as beta-phenyl-gamma-aminobutyric acid. It is a form of GABA, which is an inhibitory neurotransmitter. It is commonly known as a nootropic because it is supposed to increase neurological productivity. It is about fifty years old, being discovered in the 1960's in Russia. Phenibut has been around for quite a long time so it has been used for a variety of different functions. It supposedly has ingredients that improve cognition and has nootropic and anxiolytic properties. One of the things it does is it actually stimulates the dopamine receptors as well as negating the beta-phenethylamine. Phenibut is a really close relative of Baclofen, and has a lot of other derivatives. Phenibut is used worldwide to help with fear, anxiety, tension, cognitive disorders, and also neurotic patients and insomnia. It is supposed to have some effect on brain power, although it's actual effects are quite controversial. It is used as therapy for a variety of different disorders including depression and asthenia. It is also common to see Phenibut used for post-traumatic stress and vestibular problems. While Phenibut is often considered a nootropic; it actually does not meet all of the requirements to be put in this category. There have been many studies on animals to see if Phenibut reacts positively or negatively on brain power and memory loss. In mice studies, this drug seemed to cause some improvement on the passive avoidance test. This test consists of the mice being put somewhere undesirable, and then using some sort of shock to keep them from leaving. The test is designed to see if the mice remember that they will get shocked if they try to leave the area. There have also been studies that have shown that Phenibut was ineffective in helping mice make it through a maze or shuttle box. So Phenibut has been shown to have some effect with brain power and memory loss, but apparently it is only in certain situations. Another link between Phenibut and brain power is neuro-protection. There have been some other studies that have shown that this drug will sometimes increase the resistance of the bad effects of edema. Edema destroys the mitochondria and also hinders the ability of the brain to produce energy. Phenibut also is supposed to protect against dopaminergic neurons and also prevent major changes caused be injury to the cerebral area. Is Phenibut an Effective Memory Loss or Brain Power Ingredient? This is a debatable subject. 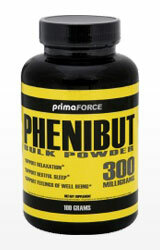 But overall, phenibut is not an effect way to prevent memory loss and improve brain power. While it does have some nootropic properties, it is not enough to make any real improvement in your neurological section. On top of that, there are some other negative aspects of the drug. For one, it has some anticonvulsant activity against certain drugs but not others. Its effects are not consistent so it is hard to find stable uses for it. Also, the drug usually has extremely unpleasant withdrawal symptoms. The withdrawals usually include insomnia and anxiety and can last up to fourteen days afterwards. The longer you have used the drug, the worse your withdrawals will be. Some cautions are to never use the drug with prescriptions and alcohol, or any type of sedative.